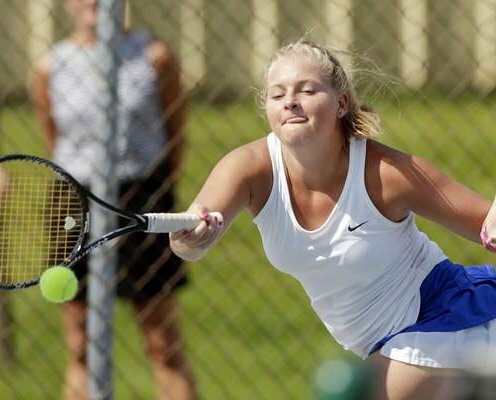 The Iowa Girls High School Athletic Union has released the regional tennis pairings for the team state championship at both levels. In Class 1A, Region 4 has the most action from around the area. Pella will be hosting four of the 16 team field, and Oskaloosa will be competing with Knoxville in the first round. Winner of that dual will face either the host Dutch or Albia. The first round for all matches begins at 9 AM on Saturday, May 16th. The second round will be around 1 PM. The last team standing from the four team section will advance to the regional final at the University of Iowa Tennis Center in Iowa City on Saturday, May 23rd. The regional final winner will meet the team who made it through the other seven in the other half of the bracket in the first round of the state tournament in Muscatine on Tuesday, May 26th. In the other half of the bracket, Maharishi is hosting Fairfield, Davis County, and Mount Pleasant in their four-team bracket. The team who makes it out of there will have their regional final in Fort Madison on the 23rd. In Class 1A Region 3, Pella Christian is hosting Centerville, Chariton, and Grinnell. The Eagles will also host that bracket’s regional final, even if they don’t advance. In Class 2A, Ottumwa is in Region 4 and received a first round bye. The Bulldogs will face either Iowa City West or Burlington in Cedar Rapids on Saturday, May 23rd at 9 AM. The Bulldogs need just two dual wins to qualify for the state tournament. Courses for dual high school and college credit are available to juniors and seniors through Iowa Lakes Community College. Iowa Park High School is a public school in Iowa Park, Texas (USA). It is part of the Iowa Park Consolidated Independent School District and serves students in and around the Iowa Park area. In 2011, the school was rated "Academically Acceptable" by the Texas Education Agency.